Free, but drinks are additional. RSVP via Facebook to reserve a spot. Join us for night of nineteenth-century debauchery at several of New York City’s oldest bars and most notorious dens of vice! We will meet promptly at 5:30 p.m. at Ryehouse (11 West 17th Street), a new bar that revives and reinvents the classic cocktail. From there, we’ll head to Madame X, The Ear Inn, Onieal’s Grand Street and (should we still posses the fortitude and sobriety) Ward 3. The perfect outing for cocktail enthusiasts and history lovers alike–come sip drinks in some of New York’s most historic pubs and bars dedicated to the revival of classic drinks. Appropriate nineteenth century attire is encouraged, but by no means required. 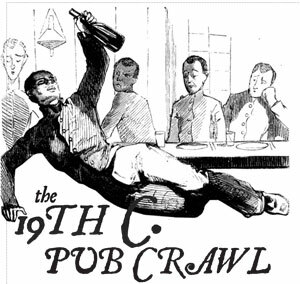 Visit www.19thcpubcrawl.com for the most up-to-date information including exclusive drink specials.